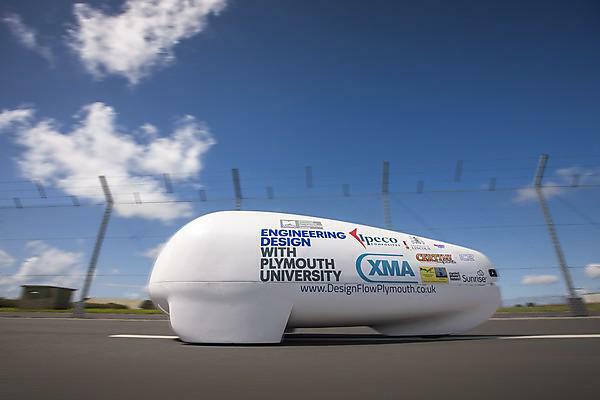 A team of students, academics and technicians from Plymouth University are planning a renewed attempt on a land speed record in September 2016. Mechanical and composites engineers and students had spent a year developing, building and testing an arm-powered vehicle ahead of the World Human Powered Speed Challenge in Battle Mountain, Nevada. However, a pre-existing injury meant paracyclist Liz McTernan was unable to compete at full power on the Plymouth handcycle, nicknamed ‘Beluga’, although she was able to set a new women’s benchmark of 24.72mph on a conventional racing handcycle. Instead, Lecturer in Mechanical and Marine Engineering Design Adam Kyte took to the controls of Beluga and, despite having never ridden a handcycle before, achieved a speed of 30.45mph. Most importantly, the team managed to log data from sensors on the handcycle to analyse its performance, and work out how it can be optimised to perform even better ahead of a revised attempt next year. The design and production of the handcycle built on the previous student dissertation and project work over the past three years, and drew on specialisms ranging from aerodynamic and structural computer simulations to precision composite manufacturing techniques. The handcycle has an aluminium frame and composite shell, and was constructed with the help of University technicians Julian Seipp, Richard Cullen, Rick Preston and Neil Fewings. The whole endeavour was also made possible thanks to many sponsors and supporters who provided funding, equipment or services, including: XMA; Ipeco Composites; Baron Controls LLC; Certini Bicycle Company; Sunrise Software; University of Lincoln; Inspired Cycle Engineering; Cyclepowermeters.com. Additional funding has also been provided by Plymouth University’s School of Marine Science and Engineering. Whether you want to be a composite development engineer or a manufacturing process engineer, we’ll work with you throughout your degree to make sure you’re prepared and ready for your career in the marine industry.